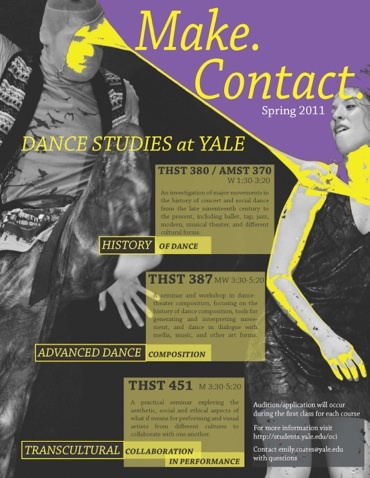 Building on the foundation of occasional dance courses offered at Yale since the early 1980s, Theater Studies currently supports a wide-ranging program in dance studies. The curriculum consists of studio and seminar courses that cover the history, theory, and practice of dance forms spanning time and geography, from contemporary West African dance to The Twist. Click here for the complete list of 2018-2019 courses. An examination of dance on film c. 1900 to the present, including Hollywood pictures, the rise of Bollywood, avant-garde films of the postwar period, translations of stage choreography to screen, music videos, and dance film festivals. The impact of industry, circulation and audiences, aesthetic lineages, and craft in the union of the two mediums. Students develop an original short film for a final class project. A critical investigation of introductory concepts in physics through the lens of dance. Topics in physics include the normal force, friction, Newton’s laws, projectile motion, potential and kinetic energy, and conservation of energy. Topics in dance include aspects of dance history, contemporary artists who engage with science, and the development of movement studies. Class meetings include movement exercises. Co-taught with physicist Sarah Demers. An intensive study of the history of American dance theater from the 1960’s to the present, leading to the creation of solo and group dance pieces. In the fall, the course focuses on the study of various movement vocabularies through exercises and repertory drawn from ballet, modern, and postmodern dance. In the spring term, students apply this knowledge to create dance theater pieces, guided by exercises in composition and collaboration. Considerations of music, text, voice, props, site specific work, and interdisciplinary discourse in relation to dance. The nexus of speech and movement—the locus of all great theater—explored through the development of original works combining text and choreography. The relation of language and movement; the body and motion inherent in writing; the poetic imagery that informs great choreography. Questions relating to syntax and inflection, translation across mediums, and the explosion of semiotic interpretations that arise out of the synthesis of verbal and kinesthetic art forms. Co-taught with Deb Margolin. Musicals and choreographers that influenced and altered the form of musical theater through dance. The growth of choreography as a primary story-telling element in American musical theater; the content and form of major dance musicals; the historical context in which such works emerged. Discussion of historical trends supplemented by studio work involving movement from classic musical shows. Co-taught with Daniel Egan. A studio exploration of American postmodern concert dance through the repertory of two key choreographers: Yvonne Rainer and Twyla Tharp. Emphasis on each artist’s historical context, evolving aesthetic, and performance philosophy. The course culminates in a final performance. An examination of major movements in the history of concert and social dance from the late nineteenth century to the present, including ballet, tap, jazz, modern, musical theater, and different cultural forms. Exercises are used to illuminate analysis of the body in motion. A seminar and workshop in dance-theater composition. Focus on the history of dance composition, tools for generating and interpreting movement, basic choreographic devices, and dance in dialogue with media, music, and other art forms. Choreographic projects developed over the course of the term are presented in a final performance. A studio-based inquiry into the epochal shift in choreographic aesthetics known as postmodern dance. Through reconstructions of key dances from the 1960s and 70s, the course will consider the social and historical context in which the work emerged, as well as the evolution of postmodern dance aesthetics into the present day. The boundaries between live and mediated performance explored through the creation of an original work that draws on methods in experimental theater, dance, and video art. Questions concerning live versus mediated bodies, the multiplication of time, space, and perspective through technology, and the development of moving images. The final production includes both a live performance and an art video. Co-taught with Joan MacIntosh and Johannes DeYoung. A seminar that investigates some of the most pressing issues at the nexus of writing and performance. These include the position of the writer vis à vis the object of analysis; various documentation, archiving, and counter-archiving practices; the relationship between the archive and the repertoire; and diverse modalities such as critical, experimental, and performative writing. The course also explores digital platforms for the synthesis of visual, audio, and textual material. Co-taught with Dominika Laster (2014) and Elise Morrison (2018). Marshaling both artistic and academic methods, and with dance as the focal point, this course examines technologies that traverse disciplinary boundaries. Topics include: somatic practices that emphasize internal sense perception; choreographic notation; dance dramaturgy; digital motion capture; the intersection of cognitive science and dance; and ethnographies that draw strategies from the arts to probe social problems. Open to all students.